The cold weather has really been upon us here in my area of New York this week. The schools were closed last Friday and this past Monday because of ice and snow and the temperature has barely risen above 20°, with wind chills in the morning below 0 just about every day. This makes you feel like just bundling up under the covers and going back to bed each morning and not bothering to even think about what you might want to make for dinner that day. Of course, one of the best alternatives for this time of year for lunch or dinner is always a nice bowl of warm soup. One of my all-time favorite dishes always make use of some of the great winter squash that is available and makes a nice thick squash soup to have with some homemade bread or rolls to help fill you up and really keep you warm. This particular recipe, for a roasted winter squash soup, comes from the Cooking Channel and is from Michael Chiarello. It makes use of a really nice toasted spice rub that you use for the squash and the soup itself and while it may seem like there are a lot of steps involved, the prep time outside of getting the squash ready (which you can do well in advance if you like) only takes about 20 minutes and the cook time is not much more than that, so you can have everything done and ready in about 45 minutes. To make the toasted spice rub, toast the fennel seeds, coriander seeds and peppercorns in a small, heavy pan set over medium heat. When the fennel turns light brown, work quickly. You may want to turn on the exhaust fan over your stove as it can get quite smoky. Add the red pepper flakes and toss rapidly, mixing the ingredients quickly. Immediately turn the spice mixture out onto a plate to cool. Once the spices have cooled, put the mixture into a blender with the chili powder, salt, and cinnamon and blend until the spices are evenly ground. If you have a small spice mill or a coffee grinder dedicated to just grinding spices, grind only the fennel, coriander, pepper, and chili flakes. Pour the ground ingredients into a bowl and toss with the remaining ingredients. Keep the spice mix in a glass jar in a cool, dry place. For the roasted squash, preheat the oven to 400°. Peel the squash with a vegetable peeler. Halve the squash lengthwise, discard the seeds, then cut the squash into a 1-inch dice. Place the squash in a large bowl and season it with salt and pepper. Heat the butter in a medium skillet set over medium-high heat. When the butter ceases to foam and has turned a light brown, pull the pan off the heat and immediately add the sage, granulated sugar, balsamic vinegar (stand back so as not to get splattered by the vinegar and the vapors from it), molasses and the toasted spice rub. Mix well and let the mixture simmer over medium-low heat for 1 to 2 minutes so the flavors can meld. Pour the vinegar mixture over the squash and toss it well, then transfer the squash to a heavy rimmed baking sheet or baking dish large enough to hold the squash in a single layer. Place the squash in the oven and roast, tossing the squash at least once, until it is very tender and caramelized, about 45 minutes to one hour. Set the squash aside until it is cool enough to handle but still warm, so the liquids are runny. Working in batches, if necessary, transfer the warm squash and all the cooking liquids to a food processor and process until it is smooth. Use immediately, or refrigerate for up to 5 days, or freeze for up to 2 months. For the soup, heat the olive oil in a large saucepan or Dutch oven over medium heat until it is shimmering. Add the onion, celery, carrot, and cinnamon stick and sauté until the vegetables are soft but not brown, about 10 minutes. Season the vegetables with salt and pepper. Add the chicken broth or vegetable broth and the coriander, if using, and bring the mixture to a boil. Simmer the broth for several minutes. Stir in the squash until it is smooth, then simmer gently to let the flavors meld, about 10 minutes. Discard the cinnamon stick. While it does take some time ahead of time for prep work to get the squash ready, there is not really a lot of work involved in it and it is certainly worth the effort. I used a combination of butternut squash and acorn squash but you could certainly use any type of squash that you want either in a combination or by itself. I also did add one diced apple to the vegetable mixture of the onion, celery, and carrot to give the soup a little extra sweetness and flavor. 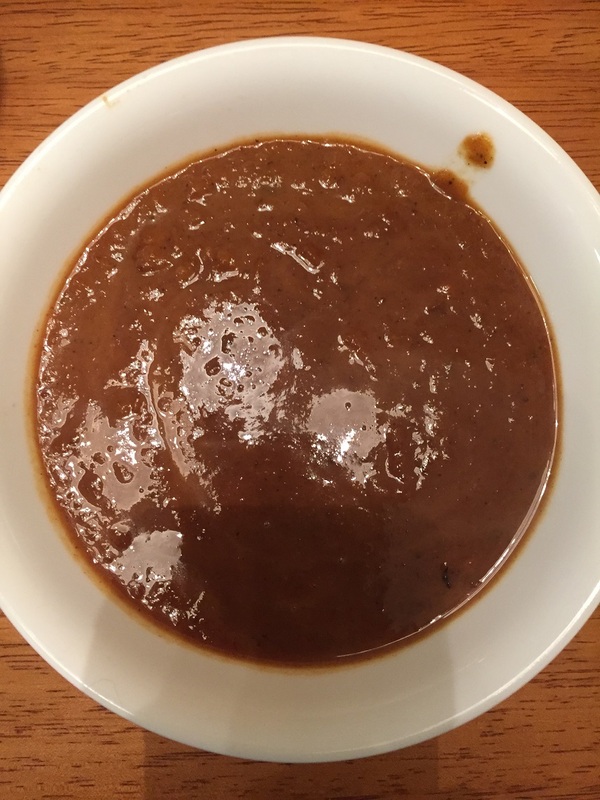 The soup comes out to be a very dark, rich color with some nice sweetness from the squash thanks to the balsamic vinegar and molasses that you put on top of it. The spice rub does give the dish a little bit of a kick, so you may want to watch how much chile powder use if you are looking for something a little milder or eliminate the chili powder and red pepper flakes altogether for something smoother. As I said, this dish is great with some homemade rolls, biscuits or bread or even just your favorite store-bought variety or you could make a nice meal with a soup and sandwich idea for lunch or dinner.